Germany is among the leading countries regarding the promotion of renewable energy towards a sustainable energy system transition. In this paper, we investigate the German pilot auction scheme for solar photovoltaics introduced in the Renewable Energies Act 2014 (EEG 2014) that serves as a pilot for the auction-based promotion of the three major large-scale renewable electricity generation technologies (wind, solar, biomass) as of 2017. A strategic bidding model is used to determine the optimal bidding strategy and to determine the resulting project value. We consider pay-as-bid and uniform pricing and single and multiple bids. Moreover, we investigate the impact of investment cost uncertainty. In a sensitivity analysis we show how bid strategy adjustments affect the outcome. Specifically, higher uncertainty regarding the market clearing price increases the project value, as this additional uncertainty can be used to raise the probability of obtaining a higher level of remuneration by an adjusted auction strategy. The first-price auction can generate additional profits by placing a second, higher bid with a low probability of success. Investment cost uncertainty can have either a positive or negative impact on the project value, depending on the auction parameter values chosen. 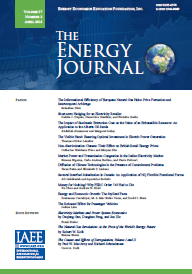 Published in Volume 38, KAPSARC Special Issue of The Quarterly Journal of the IAEE's Energy Economics Education Foundation.